The 2018 rangefinders are the best we have ever tested. The number of products is growing, the feature sets are increasing, and most still do a terrific job of giving you distance to the target. Within the last year, the rangefinder market has evolved dramatically. 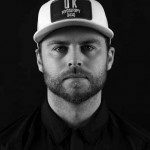 The best lasers not only capture the distance to target simply, quickly, and accurately, but many offer additional features to give you the confidence to hit the shot required. This year we approached our rangefinder testing with more critical scoring and improved protocols. This was based on an intensive look at the market and feedback from consumers just like you. Several key findings from that research influenced the rangefinder testing process for 2018. We found that some products struggled to pick up the target at the longest distance. If a product failed to acquire the correct target in three tries, the incorrect distance was recorded. Accuracy (40 Points) – The goal is to test the consistency of the distances provided. Products that performed well provide the same distances time and time again. While minor variations of +/- one or two yards were common across all models, some entries provided readings that varied by more than five yards or failed to pick up the flagstick entirely. In a sport described as a game of inches, it is imperative that provided distances are consistent. If you practice based on the distance provided by your device; even if the actual distance is different your club distances should correlate to what your device is telling. In other words, a consistent distance is more important than the correct distance. Speed (15 points) – How quick you can get from a blank display to an accurate reading. We found rangefinders with pin-sensing technology were more efficient because they notify the golfer when the distance has been captured. Units without the pin-sensing technology place a greater burden on the golfer to decide when the distance is correct. We also found non-sensing rangefinders were more likely to pick-up foreground and background objects instead of the intended target, creating a lack of trust in the measurement. Additional Features (5 points) – How many features does the unit have to help determine the right iron/shot to hit? Rangefinders don’t have to be single function devices that provide you distance to the flat and nothing else. Some provide distances to front, middle, and back of the green. Some also have Jolt or vibration technology built from within that give you confidence that the number is correct. Final grades were awarded based on total scores. The Best Overall is our highest scoring rangefinder, with additional awards given to the top five rangefinders. Additionally, more specific Best in Class recognition is awarded to rangefinders that push the industry envelope in certain categories (optics, accuracy, display, and speed). Image stabilization from Nikon is the “2018 Rangefinder Feature of The Year“. The VR (Vibration Reduction) technology found in Nikon’s lenses has finally found its way to its rangefinder line. 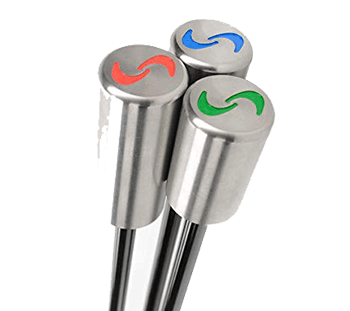 The increased stability helps golfers with even moderately shaky hands acquire the target faster and with more confidence. The optics are clear and offer a wider field of view. 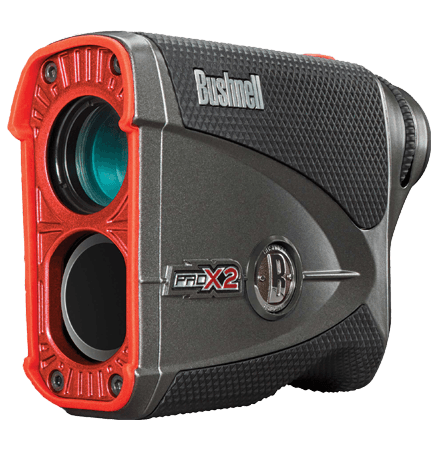 A winning addition to the laser rangefinder category. 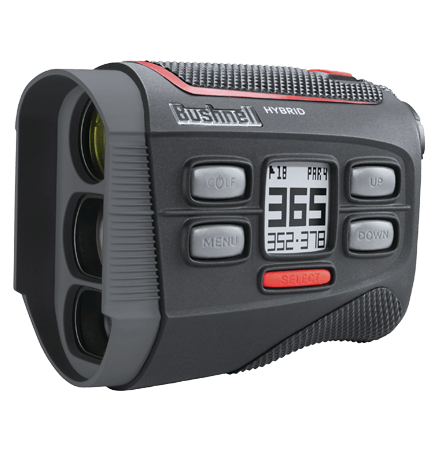 First of its kind hybrid GPS blends Bushnell’s signature rangefinder technology with an onboard GPS to give you distances to the front, middle, and back where the rangefinder alone can’t. The jolt feature provides physical feedback when the target is acquired. The hybrid offers outstanding optics while an option mobile app provides flyovers and layup distances for the hole that you are playing. 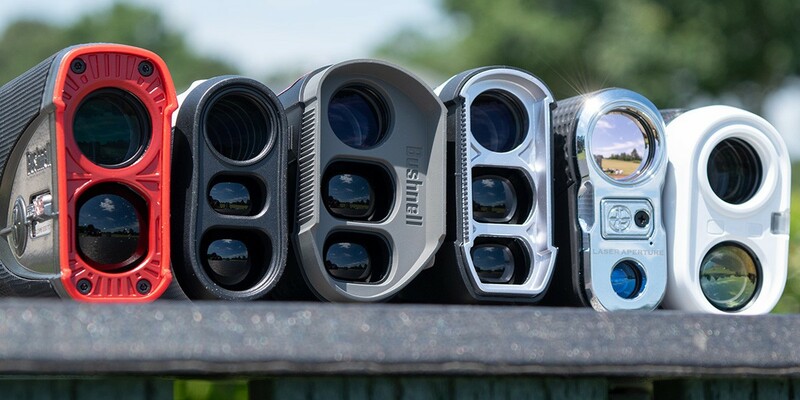 Another outstanding offering from Bushnell. The Pro X2’s display color can be changed from red to black to suit your preference and lighting conditions. It’s also one of the fastest models on the market today. Acquiring pins reliably in fractions of seconds, the X2’s precision and accuracy leads the pack. 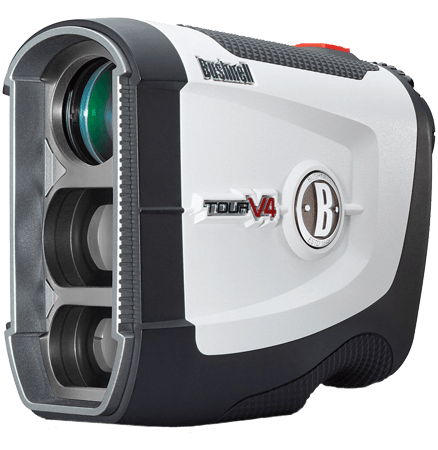 The Tour V4 is an awesome rangefinder for several of reasons. It acquires the target instantly. The bigger and brighter optics provide a crystal clear display of the target and surrounding area. An outstanding option for those who want a simple but effective product. At just $199, the Precision Pro N7 is “The Best Value Rangefinder of 2018”. 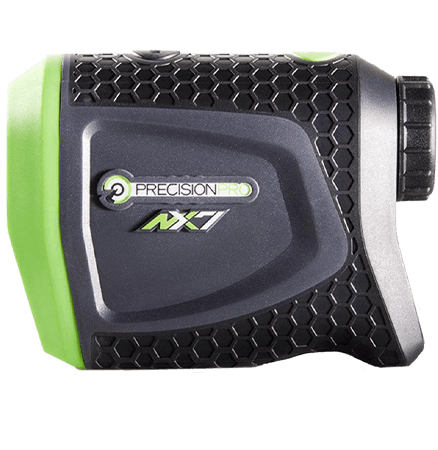 The Precision NX7 is your compact and basic rangefinder. It may not offer everything that others in the top 5 do, but the NX7 does a great job at acquiring the pin and giving you consistent readings. The NX7 is the best in value when it comes to price and performance. I have shaky hands and every time I’ve tried to use somebody’s rangefinder I struggle. 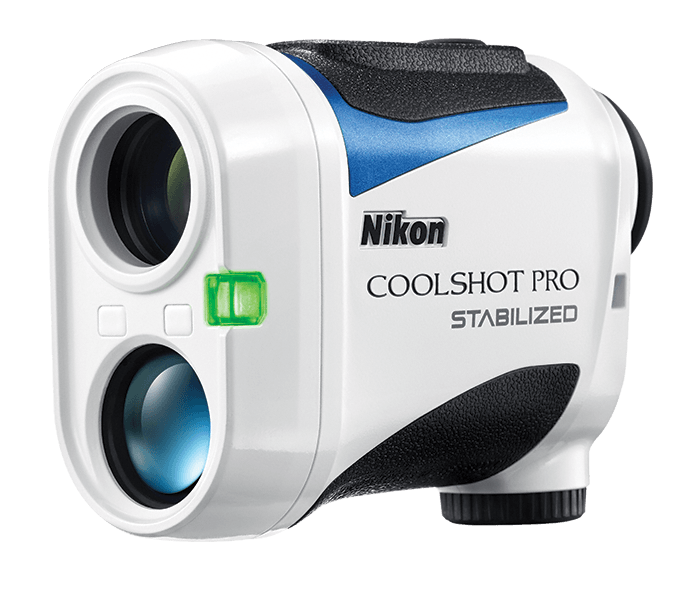 Does the Nikon Coolshot Pro Stabalized have the best stabilization of the group or is there another model that does this one thing the best? Did Leupold change their “lifetime warranty”? Their website shows that electronics (golf rangefinders) are under a 2-year warranty. I was going to purchase a Leupold strictly based on the lifetime warranty, but if they are only offering 2-years, then I’m opening my choices up to other makers as well. My Leupold is in for service right now. I was just informed that all mechanical parts are covered under lifetime warranty. My red led display is fading and I was told the electrical components are excluded under warranty. To their credit, they are offering me 60% off on a new Leupold laser. I have used Leupold lasers the past 10 years and always liked them. I will look at other options before making a decision. i picked up 3 different range finders for black friday, one of them being the Caddytek from Costco $100 interested to see how well this holds up to the big boys. Won a Garmin Z80 in an outing. I had a Tec Tec Tec, it worked fine. The Z 80 features are awesome! Having the picture of the hole in the range finder with trouble mapped out and front and back green yardages too. The target scan works great and I also like the pinepoint feature for when you can’t see the green. I highly recommend it for anyone. The prices are steep. how is the Z80 working out? I picked one up for black friday. As usual a very interesting article. I would like mygolfspy to test distance accuracy to something other than a pin with a reflector. Say what is the distance to the back of a bunker that I must clear. That is the question I want answered when playing a new course. I have Bushnell tour v3 which has served me well and pair it with a Bushnell neo GPS. Most of the time all I need to know is FRONT, MIDDLE, BACK of the green. Got Precision Pro NX7 as a birthday gift from my wife. after using it the first time, i can say that it was my best game of golf ever. What was it about the Garmin that caused it to be ranked so low. I’m upgrading from and older Leupold I’ve had for four years and want to make the right call. The Nikon Monarch 3000 seems to be the same unit as the COOLSHOT PRO STABILIZED. It’s $419 (versus $450) and does slope and image stabilization, but lacks the ability to be tourney legal, something they added to the golf version. That’s your $30 right there. The Monarch is listed to be good for 8 – 3000 yds vs. 8 -1200 yds. Really want to hear more about the Garmin Z80… seemed like that one was the most feature rich; totally different than all the others; surprised it didn’t make the top 5. I’m sure this won’t happen, but it would be great if you graded them by category and then had an option where the reader could assign a weighting to each category to see which one suits them the most. Accuracy is obviously important, but for most people buying a laser the standard +/- 1 yard is good enough. I don’t think I would so heavily weight Accuracy compared to some of the others categories. I personally play with an older, basic GPS watch (Bushnell Neo+) and have considered switching to a laser to get access to features like slope, hazards distances, etc., but I am unwilling to give up the simple and quick front/center/back yardages of a watch. For me, Features are more important. The Garmin Z80 and the Bushnell Hybrid caught my eye the most, for just that reason… you don’t give up the functionality and ease of a watch just to get a laser. I have ordered a Garmin Z80 that will be here this week, I’ll be posting thoughts on it in the forum section of the site. I’m reading this for your very same reaason, I have a gps watch neo xs and the new garmin or hybrid catched my eye.. I’m considering to keep my gps plus a simple laser rangefinder due to the monster price of the two units..
Is it harder for u to just list the data instead of creating a ranking? the ranking does not take into account how significant is the data difference. I read all MGS stuff and appreciate your work. But did all these have god enough accuracy to recommend? were there more rangers tested, and some did not make the grade and are not listed at all? Consumer Reports does testing, no paid advertising, and they list their fails as well. I agree! For example, what is the difference in accuracy between the #1 and #15? Is there a 1-yard difference or a 10-yard difference? Is there any way to drill-down to see the comments on the devices that didn’t make the top 5? For example, the Precision Nexus scored only 0.5 less than the Precision NX7, both having the same ranking on all measures except accuracy. The Nexus is $50 cheaper, yet the NX7 got a top 5 for “Best Value”. It would be nice to read the Nexus review and comments for comparison. I have a Leupold that I looove, been going strong for five years. Sturdy piece of equipment. I could test the new NIKON PRO: Outstanding! The best laser I ever had in my hands. Bright optic, perfect haptic and an amazing stabilization. So easy to measure, even for a shaking guy like me. I have to have it. What’s the difference between the Garmin Z80 and the Bushnell hybrid? Seems like some new technology to learn about. The biggest difference is the Garmin gives an overlay of the entire hole in the display of the viewfinder as well as the front/back/middle distances are displayed there. The Bushnell only gives the front/back/middle on the outside of the unit, it gives some cryptic symbols for hazard distances but they can be hard to decipher on such a small screen. I drowned my $400 Bushnell Tour V3 last month. Replaced it with a Double Eagles DEPRO-800. It cost $145. It does everything the Bushnell did only it’s better built, more weather resistant and is smaller and lighter. A doddle to use. I don’t care about ‘slope’ as in competition play, you can’t use it, so basically it’s useless anyway, and there has to be some skill factor left. The Bushnell didn’t have slope either, so I’m direct comparison, it’s a #1 for me. I have had a hybrid for 4 years gets the job done due to gps distance is fading not good on distance over 200yds ….why don’t all golf courses put reflective tape on flags… It would cost them next to nothing and would really speed up play!!! Accuracy is obviously the most important part of this test (it’s worth 40 pts). But could you define it better? If a 200$ machine gives me results just as good as a 400$ one, I know what I’m buying! But give me LaserB any day. I would think accuracy would be the overriding factor in judging any rangefinder. The winner was 4th in accuracy?? I don’t care about bells and whistles if the number is wrong. I agree that a rangefinder finishing 4th IN ACCURACY would be hard-pressed to ranked number one in a valid survey. UNLESS the differences are only FRACTIONS. (Or, as mentioned earlier, within one or two yards.) If the number one ranked tool is 4th in accuracy but still VERY CLOSE to the best and/or the Actual Number, then we have something. However, MyGolfSpy hasn’t yet disclosed the variances between the Most and Least Accurate. Doing so would be VERY helpful. “Additional Features” is meaningless if accuracy is way off. What’s more, that category should be WEIGHTED. Thanks 808, but we are just doing our job. Question: As a novice golfer, why are some people saying 350yd range is not good at all? Unless your name is Dustin Johnson, you aren’t ever going to hit the ball 350yds, so what use would there be to having a range greater than that? The longer the laser, the stronger it is. The stronger the laser, the better the ability to cut through fog, mist or rain, and the stronger the signal bounced back from the target. That is an excellent question, as the Nikon COOLSHOT is one of the top selling and reviewed golf rangefinders on Amazon. Lots of people apparently find it to be an excellent device and value. Sorry, the earlier post should have specified the COOLSHOT 20. On the Nikon Coolshot can the “Golf Mode” be turned off for local tournament play? Nikon Web site doesn’t state if it can be disabled. They just state to check your local rules. If you can’t turn it off, then how is it your #1 pick? Yes it can be turned on and off. The green light indicates when slope is turned off. As far as I read the rules regarding slope it says any device “capable” of reading slope is not legal for competition. I don’t think it matters if the slope reading feature can be turned off as it would still be “capable” of reading slope. Wouldn’t want to chance a fuzzy rules interpretation. If you are looking for accuracy, then a GPS system would be your last choice. The US Airforce intentionally makes the civilian system less accurate, even if you are on top of a mountain and can see a dozen satellites. A GPS system will never tell you how far the group ahead of you is, which a laser will. What about the practice facility? GPS is no use if verify the distance of the markers as the drive-line is moved forward and backward. Just in case there is any confusion the stabilization does not make a laser rangefinder more accurate. It just makes targeting the right object easier. Precision (the reading drift) is +- 1 yds or less. Accuracy (the calibration) is normally +-2 yds. But will be consistent on a given unit. So essentially is immaterial when dialed in for yourself. Where’s the battery life review? I’ve had my battery die mid-round on several occasions; I feel like my Golf Buddy only gets 3/4 rounds in before it’s dead. Golfspy can you please respond to the question on battery life? Thanks for the great review! I’m really disappointed in the Garmin, had my hopes set on that one, but dead last in speed and low in optics rules out the cost. I think the setup/features on it are very intriguing if they can fix the speed and optics. Surprised to see the Leupold GX 3I so low on optics, it had one of the cleanest views of all the finders, though the tint is not for everyone, it helped cut light noise. Speed score is pot on, friends bushnell was noticeably quicker. Leupold makes a great unit, they always have. The issue we are seeing is that the competition has increased and the technology has evolved rapidly. We feel that Leupold was a leader in the past but they have failed to evolve with the competition. They have stayed pretty much the same while the others have all gotten better. What exactly plays into the optics grading then? Just perceived clarity when you look through it? Some of these units have a focus and if it’s not focused it can look blurry. It’s not like you guys pulled these things apart and inspected the lenses. Not a Leupold fanboy by anymeans but ever since I downgraded to my old one and sold the fancy Leupold, I do miss it. Thanks for responding- all valid points. Hence why I haven’t upgraded and if/ when I do the bushnell Z4 is looking pretty good. Definitely agree that there are better and more techy options out there than my 3i. But, I gotta say the lifetime warranty has been absolute key! A couple years back I thought I was looking at needing to throw down $400+ on a new rangefinder when the 100-level digit went out on my Leupold. For the cost of shipping ($10?) I got a brand new, and current model as a replacement. I’ve only needed to purchase one rangefinder in the last 8-10 years. If every course had the laser prism on the flag (ridiculous they don’t given pace of play issues) a $500 rangefinder would be a complete waste. On my regular tracks that do the Coolshot 20 rings it up in a nano second. Only regret? Like everyone else no slope. PS, I didn’t part with $230. $130-40 on Amazon as memory serves. For the money zero complaints. Shuts off after 8 seconds. Got 2 1/2 years out of the included battery. I purchased a NX7 Pro, for the money it is a great rangefinder. I looked at the other models but could not justify the price difference. I pre-orderd the Bushnell Hybrid and while it’s good, it is harder to catch some pins. I wish it also had a slope feature, but I guess they need something to put in the next version. If it had slope, it would be by far the best rangefinder out there. Overall a really cool rangefinder and if you are like me and like GPS as well, it’s perfect. I always want to know how far or how short I can hit a shot and still be on the green. The distance to the pin only tells part of the story. 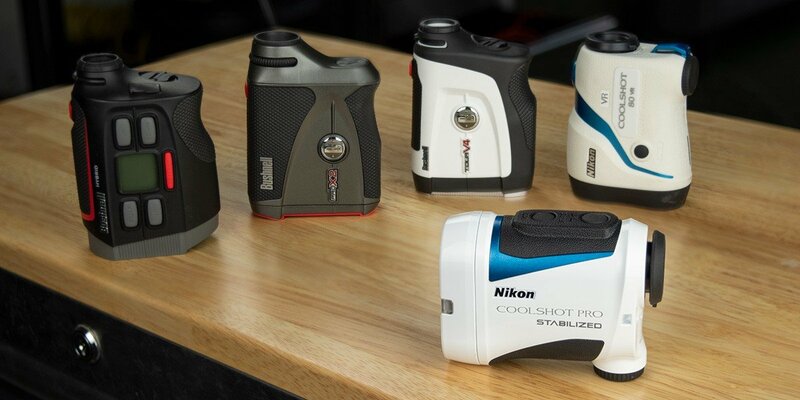 Wish you would include more lower-priced & off-brand rangefinders, e.g., TecTecTec, TourTrek, GolfBuddy, Deko, Barska, Lofthouse, LaserLink, Breaking80. Have you seen the Precision Pro Nexus ($149) and the Precision Pro NX7 ($199) and ScoreBand ($189)? They are good performing units at a reasonable price. We tested the TecTecTec and Breaking80 last year and they did not perform well. Odd. My TecTecTec is on it’s 3rd year and it has never failed to pick up a flag and is just as accurate as any of my friend’s rangefinders. If it works for you we are happy to hear that! In a head-to-head-test though is where you get to see the differences. Did you test that against all some of the ones in our test? We are confident if you did you would quickly see the differences in the optics and display and accuracy and speed of the other units when comparing to the TecTecTec. I’m sure the others are better in every way but for $120 I can live with that. All I need to know is the distance to the flag and i’m golden. I have the original Nikon Coolshot (bought factory refurb from Nikon) and it has been great. Tried a friends Bushnell and yes, it was better in every way. Still not going to upgrade because well, good enough is good enough. I’m shopping for a rangefinder so I have no horse in this race but I also remain surprised at the failure to include many other brands in this test. Check the TecTecTec reviews on Amazon and the 4 1/2 stars surpass all other makes. How can more than 2,000 satisfied customers be that wrong? While I’m aware that MyGolfSpy says they provide unbiased reviews, let’s get real: Bushnell charges those $400-plus prices because SOMEBODY has to pay Rickie Fowler! We did test them last year and both TecTecTec units we by far the worst. They are not even close to being in the ballpark with other units at similar prices. Being brutally honest, they were awful. Does anyone even trust Amazon reviews anymore? I have had a Bushnell pinseeker that got wet and crapped out. I got a Tec Tec Tec and it worked great until it flew out of the cart in a sudden rainstorm and broke the focus adjustment bezel. My buddy who I was riding with left it on the seat so he replaced it. Both units from tec tec tec had slope. The replacement had a scan feature. The second unit was junk!!! The slope numbers were way off. The number with slope uphill could be lower than the straight number. Thank goodness the original one was fixable. I super glued the bezel ring and with a little muscle I was able to get the focus to work again. Tec Tec Tec is either a great deal or a complete bust. I can testify to both sides of this story! Great thorough job as always. The precision pro sounds like a great value. I would love precise to the pin but use a GPS currently to help me on the wrong fairway lol! Just noticed the range as well, 350 yards is not good at all. They really messed up releasing this one.